The Ramaphosa Moment - How Many Messiahs Can One Country Take? 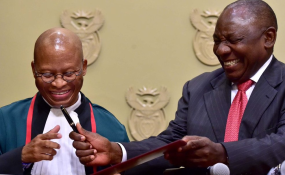 President Cyril Ramaphosa hands a pen to Chief Justice Mogoeng Mogoeng after being sworn in at a ceremony in Cape Town Thursday. Zubeida Jaffer writes an open letter to newly elected president of the African National Congress, Cyril Ramaphosa on the opening of parliament, Zuma 'sitting tight', the Steinhoff scandal and the Cape Town water crisis. Many of us were not silent observers or inactive young people when faced with the crushing reality of apartheid. I always say to students that our generation did what we had to do when we had to do it. It is for them as young people to take up the challenges of today and move us forward. It was special for me when you were elected as President of the ANC at the 54th Conference in December because you were there during those difficult days. I was seated on the floor in front of the stage amongst the hordes of journalists, all awaiting the outcome of the elections. Before all of you were ushered off the stage to clear the way for the new officials, you smiled at me and lifted your hand in acknowledgement. I wondered then whether you would make it to the top position and what would happen if you did not. I would have liked us to have a female president, but Mam Zuma's timing was off. She had also associated herself with a tendency in the organisation that had brought the organisation and the country into disrepute. I do think she is a great asset and I sense that you will draw on her skills and experience. When you were swept onto the stage, I had to smile. You were Madiba's favourite and it has taken 18 years for his wish to be realised. He was concerned that we had to break with the ethnic dominance of Xhosa and Zulu leadership in the ANC. Jakes Gerwel confirms this in Ray Hartley's recently published book, Ramaphosa. He chose you above Thabo Mbeki, said Jakes, not because he valued Thabo less but because you were Tshivenda-speaking and come from the smallest language group in the country. This milestone potentially marks the burial of traditional ethnic loyalties that remain in a country such as Nigeria. Nigerian intellectual, Kole Omotose, says in his book, Achebe or Soyinka, A Study in Contrasts, the political and the economic rivalries of the three major ethnic nationalities of Nigeria - the Hausa-Faulani, the Igbo and the Yoroba - have been the dynamo of the Nigerian political and social instability. The fanning of ethnic rivalries was central to colonial and apartheid governance. Your election will always be associated with communities reaching a level of maturity for ethnicity to no longer matter so much. We seem not to be too conscious of what the country has just achieved. After conference, I have sensed a collective sigh of relief from a wide range of people who were very discouraged over the past few years. This is coming not only from former activists but also general members of the community. People not only breathed a sigh of relief... everywhere I go I see concerned people smiling again, even laughing. I have cautioned them that your election can be both good and bad for us. It is good in that there is a real shift in leadership under way, but it is bad because we are once again focusing on a single leader to make his magic work. As you are well aware, the challenges we face as a country are substantial. It requires a leadership group that can create a conducive space for all of us to be motivated to solve the problems. I understand why team Sillili Lamaphosa (as you are affectionately called) has had to work quietly behind the scenes to pave the way for your win. But let's break with the closed approaches once you become president. Let us see you creating teams of talented people irrespective of party affiliation to become visible champions of certain challenges. Huge sections of the public have become activated by their anger at the bad leadership shown over the past period and would wholeheartedly back strong creative leadership to bring about renewal. Many people are very willing but never called upon to help especially in the school sector where there are layers upon layers of retired teachers and principals. I often watch in horror when our best minds are used for point scoring rather than problem-solving. We are paying our politicians not to serve us but to grandstand and insult one another. Will you be able to help create a different ethos, end the corruption, lavish expenditure and pointless egoism? The opening of parliament is expected once again to be a display of stupidity. President Zuma is prepared to sit tight and further disgrace us. Please use your influence to ensure that the opening is low key and not hyped up with military performance. It is unnecessary for the media and opposition parties to be obstructed in any way. The focus should be on the water crisis in Cape Town that has been so monumentally neglected in the province. The DA has only one province to run. I cannot imagine what they will do with five. Nevertheless, the opening of parliament should be about real problems facing us. In the end, God is in the detail. I cannot listen to another speech that promises magical transformation or job creation. Your commitment to time keeping recently has come as a breath of fresh air. These small actions that everyone can implement is what will make a big difference down the line. Time keeping is important, physically cleaning up our neighbourhoods and our schools and keeping them clean. Showcasing examples where business, labour and government are working together successfully creating jobs will mean more than abstract figures that promise billions in expenditure. Your team will also have to be strong enough to watch your back. At the ANC conference, they slipped up badly. When you announced that the Integrity Commission has been given teeth to act decisively, you did not know that your secretary-general Ace Magashule and some of his supporters had stopped this decision in plenary. Since then you have hurriedly come back and instructed the changes of the ANC constitution to be in place by June 2018. Unfortunately, this will remain a strong feature of the political game in the years ahead and you and your team will have to be more vigilant. I would like you to seek assistance to change the narrative that gives local business the right to hoard their resources at the expense of the public. They cannot expect you and your team to encourage foreign investment while they hoard resources that all of us have helped them create. The present Steinhoff scandal is such a clear illustration of this. With its collapse goes the pensions of many of our civil servants and there is hardly a whimper from the business sector. I am pleased that you have not bowed to international capital and shown a lack of enthusiasm for two key conference decisions: an end to the foreign ownership of the Reserve Bank and to implementing land distribution. Instead you have cleverly linked extensive land redistribution to improved agricultural production, seeing the two as being mutually reinforcing rather than in competition with each other. If handled correctly and taken together with increased free quality education for poor students, this could be a revolutionary moment for the country. We are depending on you to be an astute team player and encourage talent in every community to come forward for the good of all. Her memoir, Our Generation, eloquently tells the story of her emotional journey through the years of South Africa's turbulence into a new democracy. It has been translated into Arabic and published in Egypt. Her second book Love in the Time of Treason has been described as a "tour de force". Her most recent book, Africa The Untold Story, is the second in a series of pocket-sized books that she is self-publishing.